Flowers are in bloom, the weather is getting warmer, and you might notice that your horse is shedding their winter coat. Horses commonly shed during the spring months revealing their brand new healthy coats. This is one way to check your horse’s nutrition, by checking the condition of their coats. 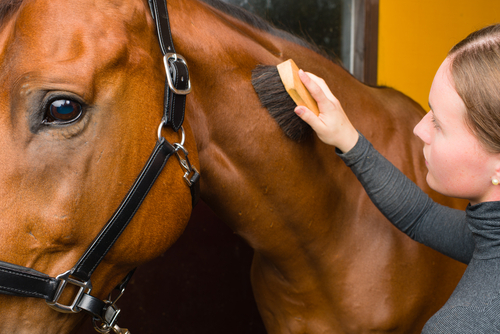 If your horse’s coat is shiny then they are receiving the nutrients they need, but if their hair is dull then it’s time to reassess your horse’s diet. Some ways to ensure or improve your horse’s health is to make sure they are receiving the right amount of food, increase the amount of fat they intake, regularly treat your horse for internal and external parasites or insect bites, and ultimately, feed them a well-balanced diet full of protein, minerals, and vitamins. To keep your horse’s health optimal at all times contact Ark Agency Animal Insurance, they specialize in covering horses and other livestock. For more information call 800.328.8894.